To read more of the story, and to view images of subway construction, click on a highlighted section of the route shown on the map. 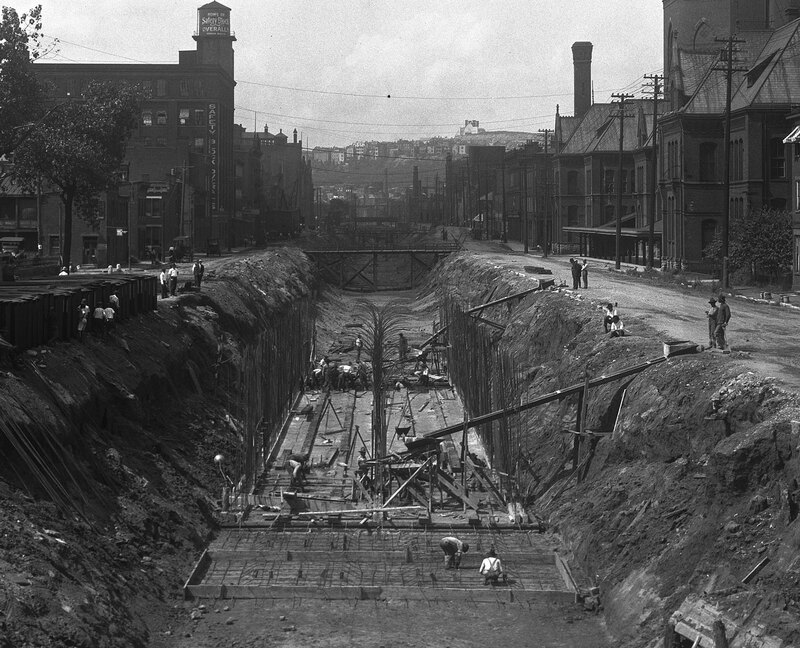 In 1920, the city of Cincinnati embarked on a major engineering project–the construction of a subway beltline system encircling the city that would provide residents in the suburban neighborhoods convenient access to downtown Cincinnati, as well as a seamless transfer from the numerous interurban railway lines directly to the central business district. 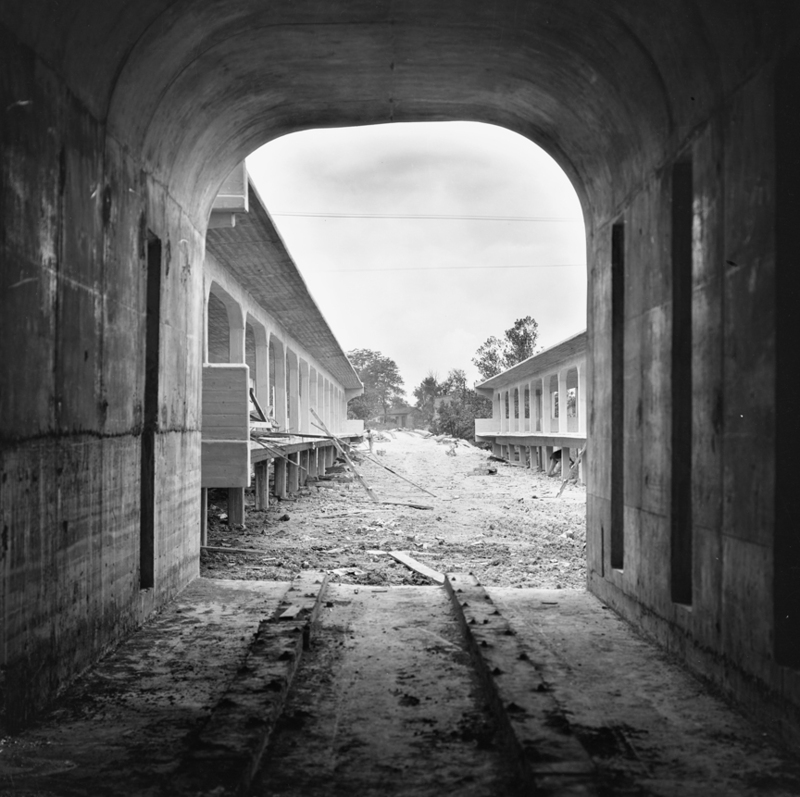 The downtown portion of the subway was to include of a stretch of tunnel constructed within the emptied bed of the old Miami & Erie Canal, over which the grand Central Parkway was to run. Beginning at Walnut Street, the subway route was to follow the canal bed west to Plum Street, then north to Brighton Bridge, a 2-mile stretch of tunnel replacing the old canal. 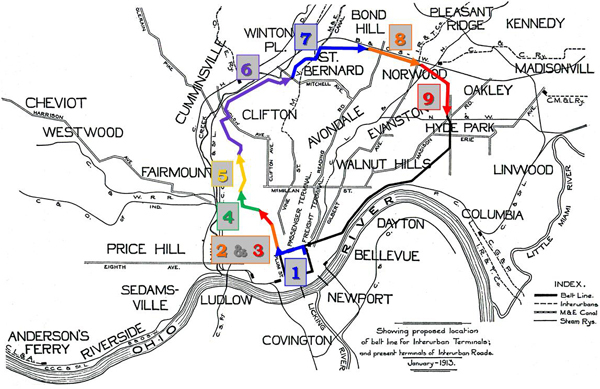 An additional 14 miles of subway line, some tunnel but mostly open track, was to navigate its way in a clockwise fashion past Northside and Clifton, curving east through St. Bernard and Norwood, then turning south through Oakley and Hyde Park, and then moving in a southwesterly direction along a bluff above the Ohio River until it reconnected in the downtown. The Rapid Transit Records collection contains 14 boxes of photographs (approximately 3850 prints) and 27 boxes of negatives (approximately 6580 negatives). Cellulose nitrate and acetate negatives have been identified and are in various stages of deterioration. Due to the sensitivity of nitrate film, a photographic service experienced in handling this type of material was located for the scanning phase of the project. Because cellulose nitrate negatives are considered a hazardous material, ARB has coordinated with the University of Cincinnati Libraries Preservation Services to place the nitrate negatives in cold storage after scanning. Pending the approval of all scans and final completion of the digitization project, Preservation Services will be responsible for coordinating the safe destruction of the nitrate negatives according to Environmental Protection Agency (EPA) guidelines. The construction of this 16-mile subway route was separated into 9 sections, with construction and engineering companies bidding on each section. 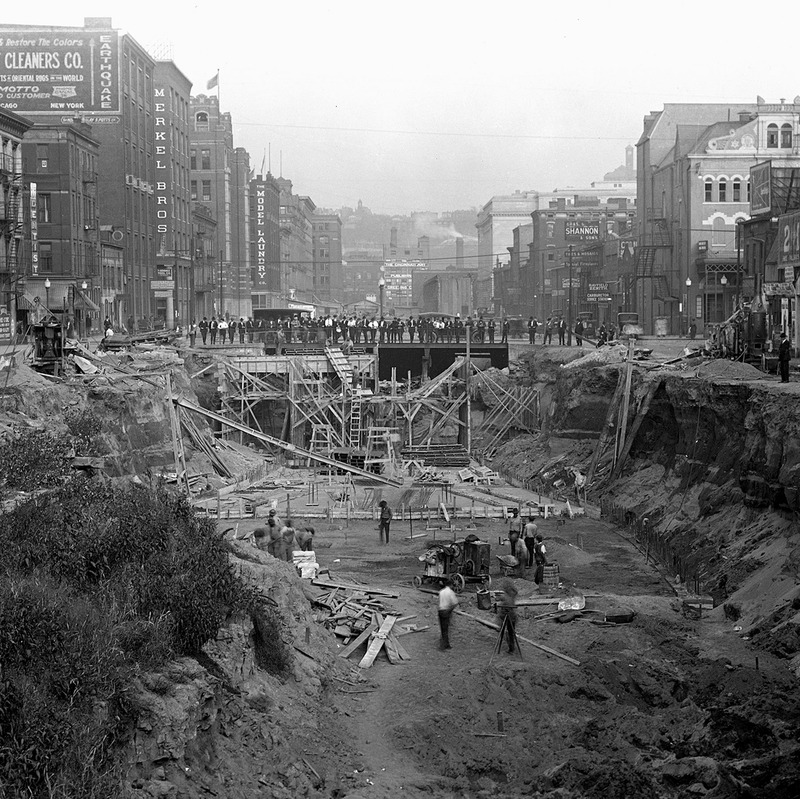 Despite the hard work of both engineers and construction crews, the subway would be left unfinished due to circumstances beyond their control, including World War I inflation, poor project management, and a general lack of support and interest from both city officials and Cincinnatians as time drug on and the automobile gained popularity. Of the 16 miles and 9 sections planned for the subway route, only 7 miles and 5 sections were constructed, and these were left unfinished with no rails laid on tracks and no fixtures installed in stations. Over the past 8 decades, new highway and road construction has resulted in the dismantling of all but 2.2 miles of tunnel beneath Central Parkway, part of which runs through the downtown from Walnut Street to Plum Street, then north to Hopple Street, and 3 underground stations located at the Race Street, Liberty Street and Brighton Avenue intersections of Central Parkway. The stations and tunnel continue to be maintained by the city on a regular basis. Central Parkway: The Making of a "Grand Boulevard"
The Parkway and the tunnel section of the subway would share a portion of the same route, beginning just east of Walnut Street at the Reading Road and Eggleston Avenue split – the site of the new Hollywood Casino—running west past Main and Vine Streets, continuing on past Race and Elm Streets to the Plum Street curve, where it would head north past Liberty Street and Mohawk Place, then under Brighton Bridge and past Marshall Avenue and Hopple Street to Ludlow Avenue. At this point, Central Parkway would terminate, while the subway being built beneath it would exit the old canal’s path and emerge on open track continuing its circuitous route east through St. Bernard and Norwood and on toward Oakley. When construction of the Parkway commenced in 1926, the majority of Cincinnati’s commuters were expected to utilize the subway for their transportation needs. Conversely, the landscaped Parkway was expected to provide a scenic route for touring motorists travelling through the Over the Rhine district and other neighborhoods bordering the route into the downtown business district. 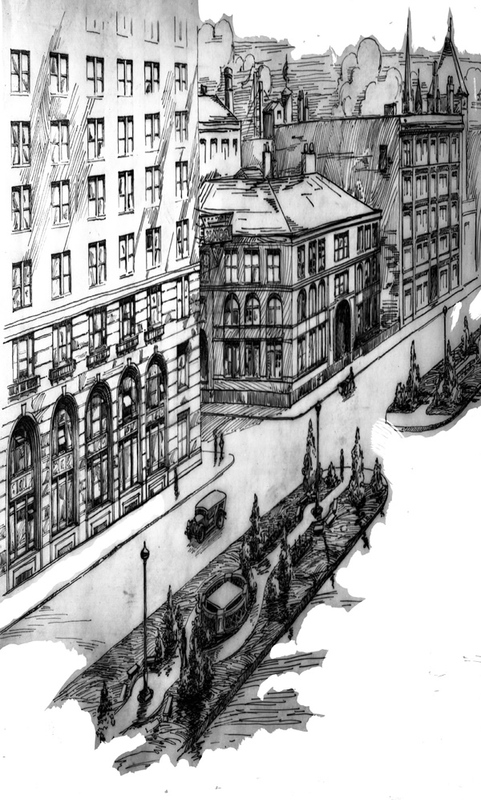 In the downtown area, it would provide a park-like setting for residents living in the grand brownstones to be built, as well as for shoppers and businessmen wanting to relax and take a break from the hustle and bustle of the city’s pace. By 1924, no construction had started on the Parkway. Delays encountered during subway construction shifted focus, and funds, to the secondary project. The Commission requested the City Engineer to begin drawing up plans for the Parkway in 1921, when Sections 1, 2, and 3 were nearly complete. 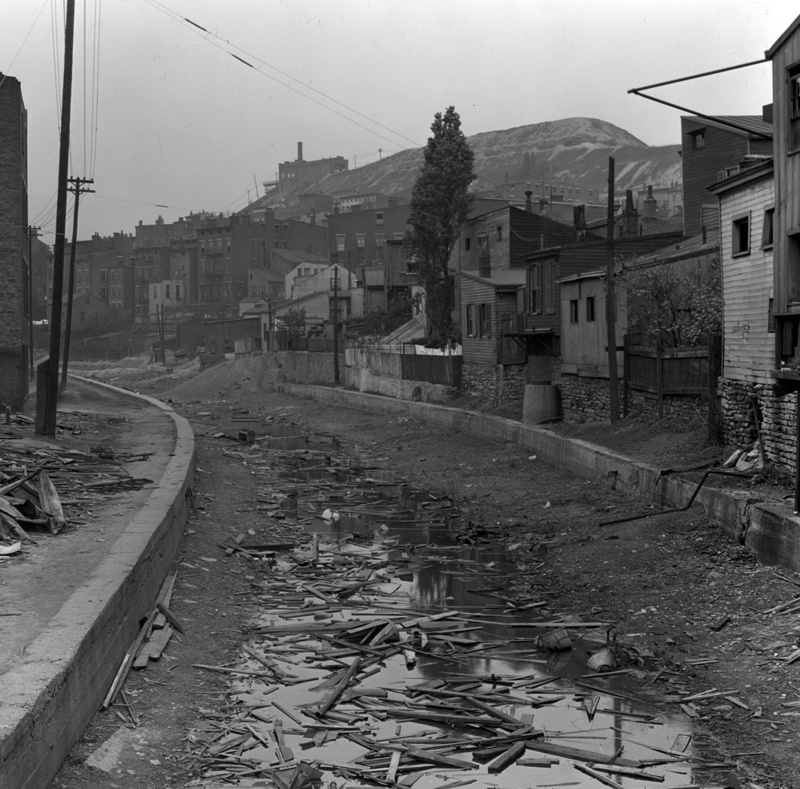 Due to the Parkway being laid out over the former canal’s right of way, surveying and excavation were required to ensure a consistent width and grade of the road surface, which was previously raised in areas where bridges crossed over the canal, or lower in areas where streets ended at the canal. Entrances to homes and businesses along the Parkway’s route needed to be adjusted based on the new grading. Central Parkway was completed and opened to the public in October, 1928. Unfortunately, with the failure to complete the subway and the later construction of the Millcreek Expressway parallel to the Parkway (and ultimately the construction of I-75 which severely limited accessibility to the area), the importance of the Parkway as a front for major civic and commercial buildings was lost to the riverfront. Residential development did not occur as expected, either. Very few buildings have been constructed along the Parkway over the past decades, with the exception of the Kroger Company headquarters and the School for Creative and Performing Arts among the few. Restoration and adapted reuse of some buildings contemporary with the Parkway’s construction has seen a rise, but mainly as residential centers consisting of small studio apartments and condominiums. Central Parkway, especially the section north of the Plum Street elbow, has endured a roller coaster ride of economic and civic hardships and recoveries, but with no significant upswing on the horizon. D.P. Foley General Contractors of Cincinnati won the bid to construct Section 1, a stretch of subway tunnel to be built within the emptied canal bed from Walnut Street west to the turn at Plum Street, and continuing north in the canal to Charles Street. Foley Contractors lifted the first shovelful of earth from the emptied canal bed on January 28, 1920. Work on Section 1 was completed in December, 1921 and included the dismantling of bridges over the canal, reinforcement of building foundations located along the route, and construction of Race Street Station. Hickey Brothers of Columbus, Ohio, were selected for Sections 2 and 3. Section 2 continued the tunnel construction within the canal bed from Charles Street to Oliver Street, with a below-ground station built at Liberty Street. Work was completed in November, 1921, although the station was not finished. Section 3 continued north from Oliver Street to just past the Mohawk Bridge. This work included dismantling the elaborate bridge that could be raised and lowered over the canal to allow boats to pass under. In 1923, Hickey Brothers established an office in Cincinnati to manage the subway construction work and branch out into other local construction contracts. The Fred R. Jones Company won the contract for Section 4, which ran north from Mohawk to Brighton. 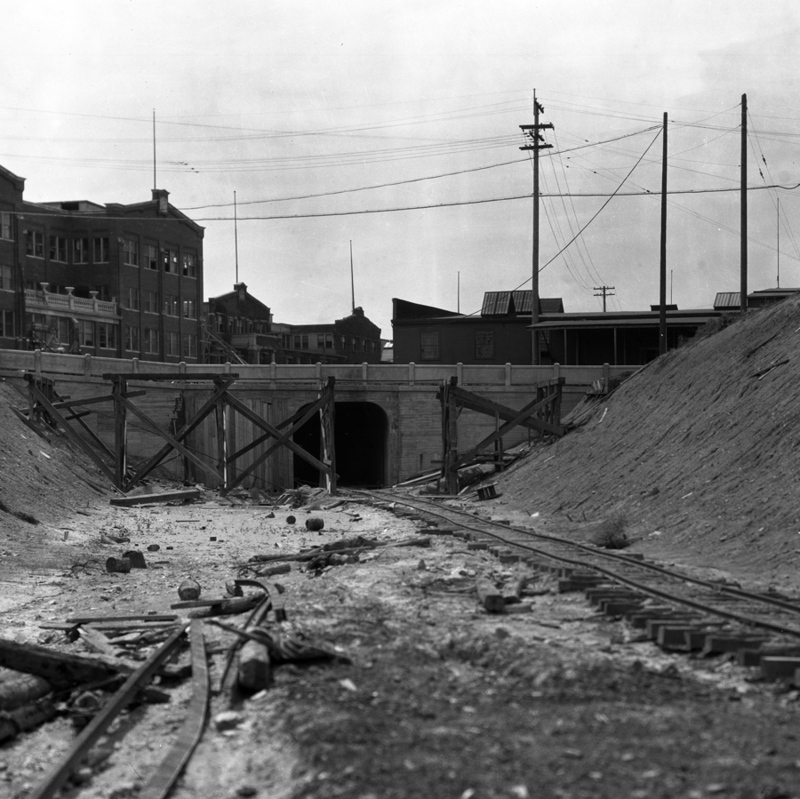 This was the last section of subway tunnel to be constructed within the old canal bed. This stretch would include building the Brighton Station, one of the below-ground subway stations. Additional work to reinforce structures along the route was required, including underpinning of the Bellevue Brewery foundation as seen in the image of a blueprint below. The construction of a new bridge at the Crosstown Bridge site was also required. This bridge would later be dismantled, replaced by the concrete bridge which stands today. The Hickey Brothers won the final 5 bids, for Sections 5 through 9. Section 5 required blasting a one-and-a-half mile section of the hillside between Brighton and Hopple Street for tunnel construction. Many structures, both residential and commercial, were damaged during this phase of construction and claims were made to the city for reciprocity. Thousands of dollars in damage claims were paid out to Cincinnatians at this time. Photographs of home interiors documenting the damage were taken as evidence and may be found in the collection. These images provide great insight to domestic lifestyle of this area of Cincinnati during the 1920s. 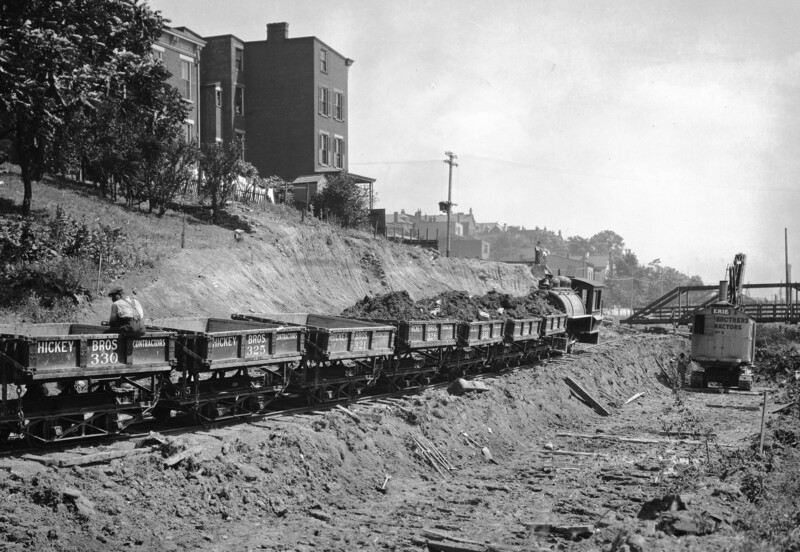 Construction of the open-track Section 6 from Hopple Street to Mitchell Avenue was completed by the Hickey Brothers Contractors in February, 1924. This stretch of surface track included two surface stations which spanned both sides of the tracks, for passengers to board and exit the train cars. One station was built at Ludlow Avenue and the other at Clifton Avenue. Both have since been dismantled, but images of the roughed-out stations give an idea of just how extensive the subway was meant to be and how determined the contractors were to complete their assigned portions. The remaining Sections 7—9 would encompass construction of the 5.5 mile stretch from Mitchell Avenue to Oakley, and include both open-surface tracks as well as tunnels beneath St. Bernard, Harris Avenue, and the B&O Railroad. A great deal of surveying and excavation was done for a portion of these sections, but work would come to an end in 1926 due to a variety of reasons, including a lack of funds (the $6 million budget was spent by 1926) and a lack of interest by both the city government and the citizenry as a whole.